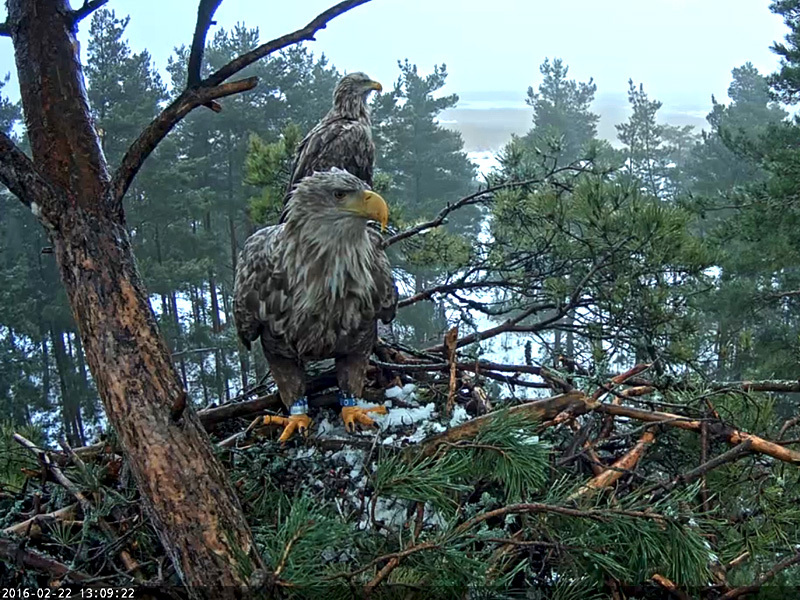 When we celebrate Estonia’s 98th anniversary the eagles are prepared to do so too. Two days before the Anniversary of the Estonian Republic the female arrived in the white-tailed eagle nest where the webcam is installed. The male who until then had guarded the nest alone at once became active, started to arrange nest material, brought more branches, talked with his mate. 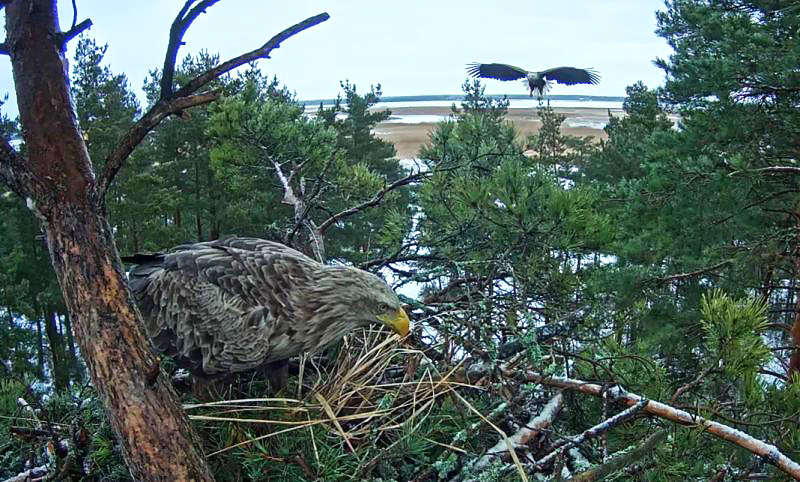 The white-tailed eagle pair that we watch is not quite typical because the female is smaller than the male. But so what, the male will take more of the protection of the nest on himself. He looks active and capable. 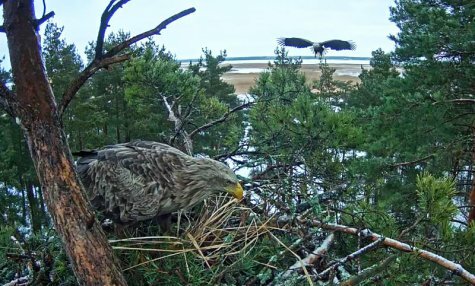 Just as there would not be an Estonian state without the events of 98 years ago, so we would not have a white-tailed eagle nest to watch either if the ancestors of these white-tailed eagles a hundred years ago had not been busy in the same way even then – waiting for their mate, getting offspring. 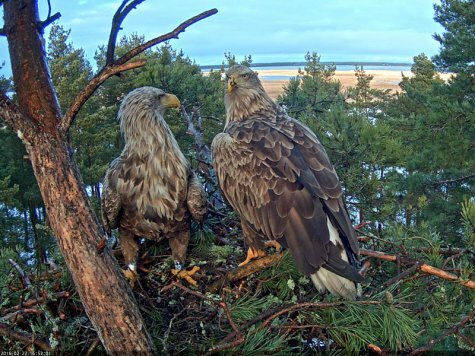 If we had been able to watch the nest life of white-tailed eagles in 1962 then Tiit Randla would certainly have suggested a white-tailed eagle as the Estonian national bird. Because on February 24th their nest life started and this could be worthy of appropriate celebration. But the official reason would have had to be something else … for the celebration as well as for the selection. 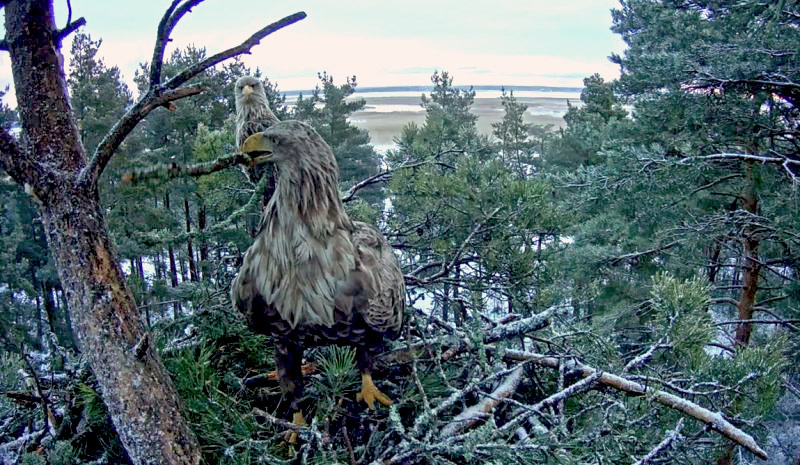 Even Kustas Põldmaa would hardly have had any objection to the white-tailed eagle. 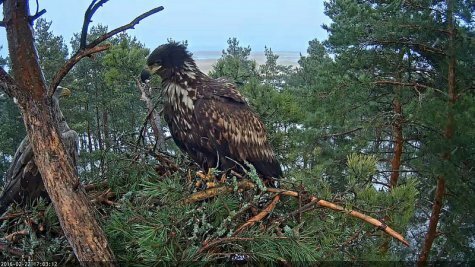 The female that has arrived in the nest can also be seen as an Estonian national symbol– she has rings in the national colours on her legs (we know that she was born 50 km to the south and we have no earlier records of having met her). Estonia as country of birth is indicated by the blue-and-white ring on the right leg and the hatching year 2009 by the black-and-blue ring on the left leg. Today there is nothing particular in that combination but in 1984 when we started to use coloured rings for Estonian white-tailed eagles, our Swedish colleagues arranged for us to be able to use our national colours officially for three consecutive years. 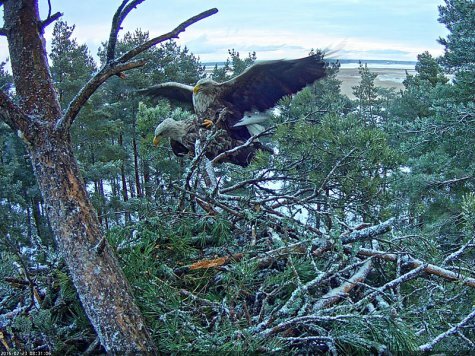 Of course such a fringe benefit increased our interest in ringing white-tailed eagles – who would not at that time have wanted to use the national colours in ringing. And the result was soon visible to all – in 1987 we could already wave our national flag (without any great fear). 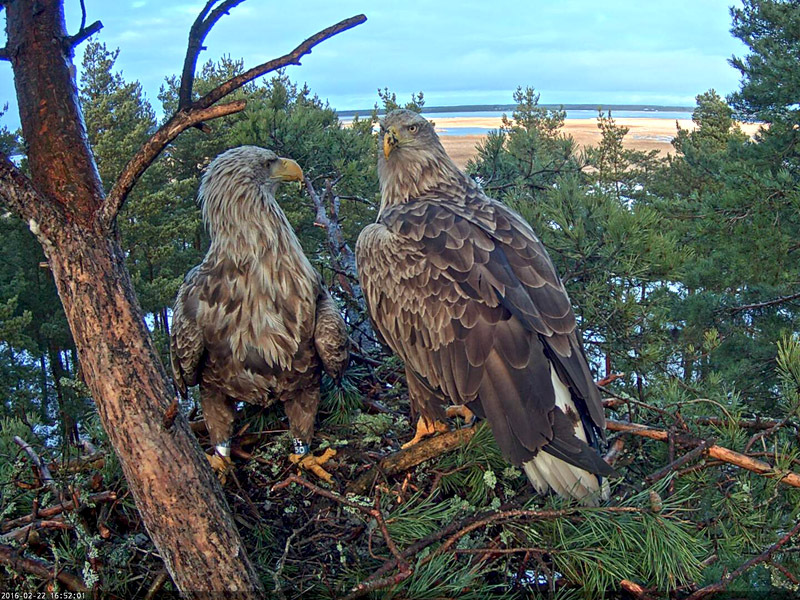 Meanwhile the construction work is disturbed by mischievous juveniles who seem to have more muscles than sense. Life experiences are still scanty, they don’t know how to handle their own size. The voice and size of the male was not enough to keep them in order. Although it will still take time until the egg-laying, nest lining materials are already noticeable. The male tested the camera cable too with its beak, luckily Omar put a double protective layer on it when we completed the system, and the cable did not turn out to be very interesting. It is quite right to think and act for the future on the frosty morning before Independence Day.